Pressure Cooker Showdown: Which is Best? Want to buy a pressure cooker? Read this post before you buy. Let me get this out of the way first: I’m not being paid to review either of these items. If you happen to buy one from clicking on a link, I’ll pick up a few pennies from an Amazon commission, but I honestly have no vested interest if you buy one or the other, or none at all. This is an unbiased review of your options, one I wish I had before making my investment. 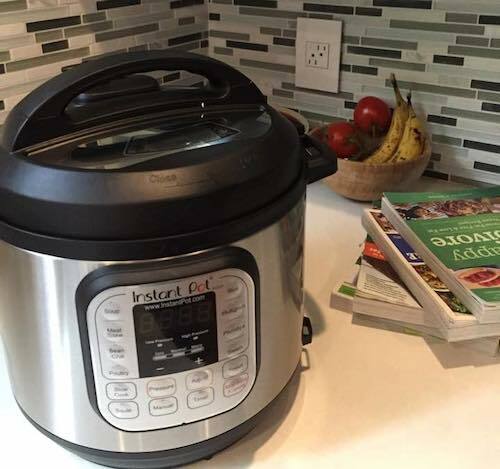 I think one of the reasons InstaPot has become so popular is because a lot of bloggers are paid to review them and get a substantial kickback if you buy one from them. It creates a trend, though perhaps not an honest one. Heck, even I bought into all the buzz and hype which is why I now own both! There are two types of pressure cookers: stovetop and electric. ...and it scared the beeejeezus out of me. I always thought I was going to blow up my apartment using it, which is completely irrational, I know. (They’re totally safe). Nevertheless, I tried to use it a few times to cook dry beans and they never came out quite right. I don’t fault the pressure cooker. I was living in a crappy apartment, using a crappy electric stove, and living at high altitude in Colorado, (plus there was no shortage of user error I’m sure)... so off to Goodwill it went. and if that’s your interest, you probably want an electric pressure cooker. You can leave it completely unattended, and I often do -- cooking big batches of beans or vegetable broth while doing laundry, watching TV, or even when I’m out all day. I bought my first electric PC about three years ago and have used it nearly every day since. I don’t “cook” in my pressure cooker, I use it mainly for preparing bulk ingredients passively. I use it to cook dry beans (which is well worth the investment on its own in my opinion. It’ll pay for itself within two months if you previously bought canned beans), potatoes, squashes like acorn or kabocha, corn on the cob, artichokes, and greens like kale. 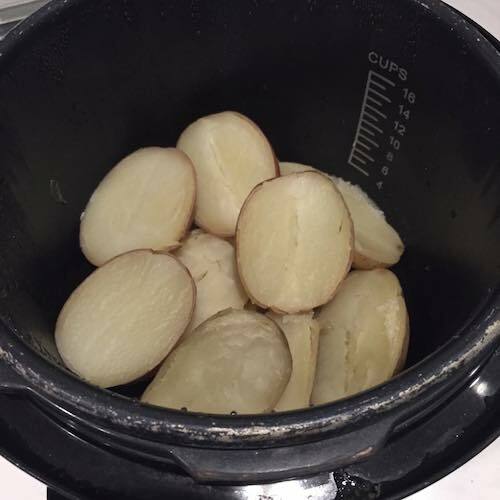 Basically starchy or thick vegetables that would otherwise take a while to bake, boil, or steam I now pressure cook. I also make huge batches of broth from my vegetable scraps. (See this post and video). You can also cook grains in your pressure cooker, but I don’t like the way pressure cooked rice comes out. I’ve been so spoiled by my rice cooker that I still prefer it for rice, and I’ve found having both the pressure cooker and rice cooker can be a big life saver when I need to MEGA multitask (I need beans AND rice). Of course you don’t need both -- you could just be better about planning and time management (woe is me). One more honesty: PCs are NOT faster (not really). The ‘cook time’ is less, true, but you also have to factor in all the time it takes to reach pressure, and the time it takes for the pressure to release after. The idea that you put beans in a pressure cooker and 15 minutes later you have cooked beans is not the reality. Beans take about an hour all said and done, which is about half the time as the stove top (and no soaking is required), so that IS awesome -- but the PC is not always as fast. Greens, for example, take less than 5 minutes on my stove top. 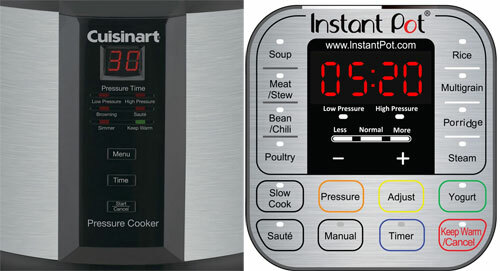 They require 1-3 minutes in the PC, but it takes at least 5-7 minutes to reach pressure before the cooking even starts. If I quick release the pressure, it takes another minute -- if I don’t, another 3+ minutes. So it’s not less time, but it is less attention. I think the real selling point to PCs is that you can batch cook unattended. Speed is sometimes another bonus. Comes apart, so you clean it really well. I found the InstaPot very intimidating initially. I think it was all the buttons. I really like the basic, minimalist control panel of the Cuisinart. It’s simple and more intuitive for me. For example, I put my kale or beans or potatoes in, select high or low pressure, push the button to count up the minutes I want it to cook, and voila! I’m on my way. It took me a solid 10 minutes trying to figure out how to use the IP in this fashion. I didn’t want soup, or grain, or any of the other settings --- finally I figured “manual” was the button I wanted. I also find the IP top to be much harder to use, though all PC tops are pretty tricky. I do love that the IP makes a little noise to let me know if it’s on correctly, however. What I really loathe about the IP is that it automatically starts at 30 minutes. I can’t think of ANY item I’d cook for 30 minutes in a PC. I have to then push the button several times to count down the timer since most things I do have 1-3 minute cook times. It’s a lot of button pushing annoyance. The IP automatically starts after a minute, too, which is nice in some ways, but not helpful in others. I prefer the “start” button requirement on my Cuisinart because sometimes I load up my PC with the intention of starting it later, such as a few minutes before other food is done. I like to time my foods so everything comes out at once for dinner, and having it ready to start (but not starting right away) makes that really easy. The IP is bulkier, especially with the handles that protrude. This makes it harder for me to pack it when I travel, though it also makes it much easier for me to move it from storage over the fridge to my countertop. The plug cord for Cuisinart comes off completely. The IP cord is permanent, but really flexible. But most of the “special” features: slow cooker, rice cooker, saute/browning, steamer, and warmer are available with ANY PC. It has a few “settings” which is special I suppose, though I have never used any of them. The unique “yogurt” feature for the IP is intriguing, though I’ve read enough blog posts on the web to see that other peeps are making yogurt in other PCs too (and in slow cookers). My Cuisinart gets to pressure faster, generally cooks in less time, and cooks more predictably. As much as I tried to be an InstaPot fangirl, I eventually came to the conclusion that the Cuisinart worked better with my neuroses and work flow. So I bought another one and ditched the IP. Both pressure cookers have their strengths and weaknesses. It really does come down to personal needs and how you’ll be using that pressure cooker. For example, if you want to do a lot of cooking (i.e. soups) in your pressure cooker, having that special setting might matter to you. If your PC items usually take more than 30 minutes, or you don’t need to travel with it, OR your family is obsessed with yogurt… the IP is probably the way to go. If you’re more like me: need it to batch cook beans and vegetables daily, travel often, want non-stick, need less bells and whistles, need a cheaper option, the Cuisinart is probably better. The REAL question - do you need a pressure cooker? 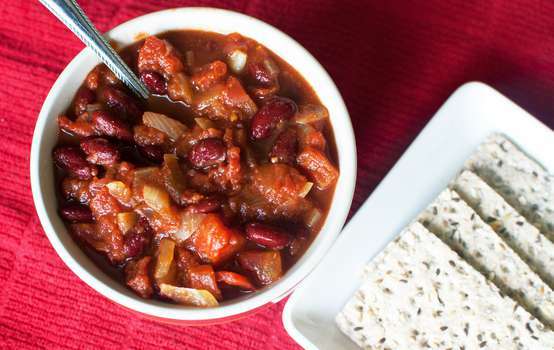 If you already do a lot of batch cooking and have a good routine with cooking bulk vegetables, beans, or rice, I would get one. I’m GUILTY of being an optimistic purchaser -- meaning I buy something thinking if I buy it, I will do something. Sort of like how I bought gym memberships thinking that would help me workout or lose weight, and it did at first until I fell out of the habit or lost my motivation. This has happened to me with many expensive purchases: buying a juicer, a bread machine, a soda stream, and the stovetop PC, among others -- all of which found their way to Goodwill. I bought these items with optimism that they would change me or help me reach some goal, and they did not. As it happens, the electric pressure cooker did change me, but I was also already maintaining a lifestyle conducive to pressure cooker use, so I was primed for that change. For example, I was already using an electric steamer daily, which I got rid of when the PC arrived, and I was making a good effort of cooking beans on the stove, and so forth, too. I hope my review and experiences have been helpful, and if they have, please share it with a friend. There are also other electric options, like this $77 Tatung that looks like an IP and even has stainless steel. If you have either (or another brand) please share your experiences in the comments. P.S. I’m starting a “Cook Like a Pro” newsletter and blog series this February. The first lesson will be about batch cooking (and using a pressure cooker!) So if you’ve been thinking about buying one… now's the time! ALSO, signup for the HH newsletter (free) here so you don’t miss the "Cook Like a Pro" series.